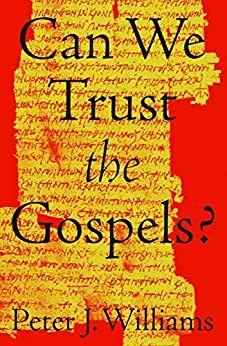 Can We Trust the Gospels?, Peter J. Williams, 2018. 160 pp. Crossway. Peter J. Williams (PhD, University of Cambridge) is the principal of Tyndale House and the consulting editor and coordinator of this project and author of Early Syriac Translation Technique and the Textual Criticism of the Greek Gospels. “This book’s title, Can We Trust the Gospels?, is therefore carefully chosen. It addresses the question by looking at evidence of the Gospels’ trustworthiness. The great thing about trust is that it is something we all understand to a degree because we all exercise it. Most of us regularly place our personal safety in the hands of others. We trust food suppliers, civil engineers, and car manufacturers literally with our lives. We also depend on friends, social media, and financial services. Of course, our trust is not absolute and unquestioning. If we see flagrant breaches of hygiene in a restaurant, we probably stop eating there. But trust is still something we exercise daily. Trusting the Gospels is both the same as trusting other things and different. It is the same in that we often have to evaluate the credibility of people and things in daily life. It is different in that the Gospels contain accounts of miracles and of a man, Jesus Christ, who is presented as the supernatural Son of God who can rightfully claim ownership of our lives But before we consider such claims, we need to ask whether the Gospels show the signs of trustworthiness we usually look for in things we believe.”- pgs 15-16. Williams proceeds to show the Gospels are trustworthy by discussing topics such as non-Christian sources for Jesus (Ch 1), The Genre of the Gospels (Ch 2), Whether the Gospel authors knew their stuff (Ch 3), Undesigned Coincidences (Ch 4), Do We Have the Actual Words of Jesus (Ch 5), Has the Text Changes (Ch 6), What about Contradictions (Ch 7), and Would the Gospel Authors Make Things Up? (Ch 8). This is fairly short book (160 pages), but I think Williams brings to light some real gems that support the trustworthiness of the Gospels. 5. that some early Christian leaders would have known of Christ’s family origins. Matthew, a tax collector from Capernaum (Matthew 9:9; 10:3), was one of Jesus’s twelve disciples, also called apostles. • Mark, not one of the Twelve, was the apostle Peter’s interpreter in Rome. Generally identified as John Mark, whose mother, Mary, had a property in Jerusalem (Acts 12:12), he was a cousin of Barnabas (Colossians 4:10), who originated from Cyprus (Acts 4:36). • Luke, not one of the Twelve, was a medical doctor (Colossians 4:14) who accompanied Paul on some of his travels round the Mediterranean and was the only New Testament writer who may have been a Gentile. • John son of Zebedee, was one of the Twelve, the younger brother of James, and a fisherman from Capernaum. “It is rarely appreciated that for us to have four Gospels about Jesus is remarkable. That is an abundance of material to have about any individual of that period. In fact, even though Jesus was on the periphery of the Roman Empire, we have as many early sources about his life and teaching as we have about activities and conversations of Tiberius, emperor during Jesus’s public activities”-pgs. 39-40. In Ch 3, Williams lists the numerous towns and geographical regions that the authors of the Gospels are familiar with. As Williams rightly notes, “the lists, of course, do not show that the Gospels are not largely fictional. The information in the lists, however, would be extremely surprising if we were to think of the Gospel writers as having lived in other countries, such as Egypt, Italy, Greece, or Turkey, and having made up stories about Jesus” (pg 54). The four Gospels demonstrate familiarity with the geography of the places they write about. In total, they mention twenty-six towns: sixteen each in Matthew and Luke and thirteen each in Mark and John (pg 55). The lists show the following: 1. All writers display knowledge of a range of localities from well known, through lesser known, to obscure; 2. No Gospel writer gains all his knowledge from the other Gospels, since each contains unique information. 3. All writers show a variety of types of geographical Information -pg 56. Ch 4 follows the work of John Blunt and most recently Lydia McGrew on evidence for what is called “undesigned coincidences.” As Williams notes. this argument demonstrates that “writers show agreement of a kind that it is hard to imagine as deliberately contrived by either author to make the story look authentic.”-pg 87. Williams gives a few examples of this in the Gospels. The goal is to show that undersigned coincidences provide evidence the Gospel authors are written by eyewitnesses. Ch 5 discusses the issue of whether we have the actual words of Jesus. Williams notes that while Jesus did speak Aramaic this doesn’t rule out that Jesus may have spoken Greek. He says “the prolonged contact in Palestine between speakers of these two languages would have ensured that many people understood some of each and that prolonged and repeated misunderstanding would have been relatively rare. Language contact means that a Jew speaking in Greek to a Jewish audience would plausibly be able to use specifically Aramaic words as recorded in Matthew 5:22 (raka) and 6:24 (mamōna), both of which occur in the Sermon on the Mount. Also, by the time of Jesus many Greek words had been loaned into Aramaic. If Jesus originally told the parable of the prodigal son in Aramaic, there is no reason why he could not have used some of the very vocabulary found in our Greek version, such as the Greek word symphōnia (“music,” Luke 15:25), which by then had been adopted into Aramaic. Jesus presumably would have spoken Greek with the Greeks in John 12:23, with the centurion in Matthew 8:5–13, with the Greek woman in Mark 7:26, and possibly also with the Herodians in Mark 12:13.”-pg 109. Since Ch 6 is about the integrity of the text and whether it has been changed or not, we should note that since Williams has been the principal of Tyndale House and the consulting editor and coordinator of this project and author of Early Syriac Translation Technique and the Textual Criticism of the Greek Gospels, he knows quite a bit about textual issues and the process of translation of the Gospels. He notes that “ given the question of the trustworthiness of the Gospel text, it is rational to have a high degree of confidence in the text of the Gospels as it appears in modern editions. These editions themselves indicate where uncertainties lie. Any changes to the text from the earliest composition would have to be limited to (1) changes to an individual Gospel, or (2) changes that were small enough to be adopted as authentic by copyists who would not want to have passed on anything they knew was changed, or (3) changes for which there is ongoing evidence in our manuscripts. One more thing: A lot of copying was done by professional scribes, who were trained and paid simply to replicate faithfully what they had in front of them. The idea that scribes acted as if they were authors or were the source of constant ideological change in texts goes against what we know about scribes from the ancient world.” – pg 122. The final chapter (Ch 7), examines the contradictions issues. Bart Ehrman and online skeptics have been relentless in attempting in pointing out ‘apparent’ contradictions in the Gospels. Williams lists some of the significant ones. He calls them “deliberate formal contradictions” -pg 123. Williams says that when it comes to John’s Gospel, perhaps “John’s Gospel has recorded contradictions at the superficial level of language to encourage the audience to think more deeply. It is somewhat similar to how Dickens opened his A Tale of Two Cities with a whole list of contradictions to characterize the inconsistencies of an era. He famously began, “It was the best of times, it was the worst of times.” – pg 127. Williams also asks since Jesus is portrayed as speaking one or both sides of the contradiction, is it possible Jesus using paradox to illustrate a point?- pg 126. Obviously there has been larger works dealing with the contradiction topic. Williams book is not as extensive as a book like Craig Blomberg’s massive The Reliability of the New Testament. It isn’t intended to be. At times, I wanted to see more extensive treatments on certain issues. But I know there are other resources on these topics. For example, when Williams mentions Richard Bauckham’s work on the use of names in the Palestinian region, this alerts this alerts the reader there is a place to turn for a more extensive treatment of the topic. From my experience, one of the largest challenges to the trustworthiness of the Gospels is the miraculous. Williams mentions this issue towards the very end of the book. Overall, this is a fine contribution to the trustworthiness of the Gospels.